Clerics in B/X don’t get a spell at first level so they spend the first few adventures UNABLE to heal people. This gives them a chance to learn more roles, like throwing holy water, turning undead, backing up the fighters or defending the mages, and so on. 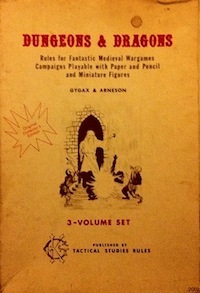 1974 D&D and the various incarnations of basic (Holmes, Moldvay, Mentzer, and the Rules Cyclopedia) do not give clerics a spell at first level. Strangely, some of the retro-clones (Labyrinth Lord, LotFP) do give first level clerics a spell. The clones that don’t are Swords & Wizardry Core, Swords & Wizardry WhiteBox, and Original Edition Characters for Labyrinth Lord. I believe the AD&D Player’s Handbook was the first place that first-level clerics are given a spell, though more knowledgeable people can correct me if I am wrong. In any case, I much prefer the no spell at first level version of the cleric. It highlights the martial aspect of the character class, which I think is very important to the cleric as demon hunter and crusader rather than purveyor of cure light wounds. This entry was posted in Uncategorized and tagged cleric on June 8, 2012 by Necropraxis. That’s a good point. I think some of my ACKS players have been discouraged by the cleric’s lack of spells at 1st (OTOH, it could also be the 100% mortality rate of PC divine casters so far in this campaign that is offputting…). Well said. It makes for good fluff as well, implying that the PC Cleric is still working to prove their worth to the Deity. Count me in the “no spell at first level” camp, too. I never liked the idea of the cleric class being fundamentally defined by spell casting. That’s the magic-user’s bailiwick. The cleric is a person of faith and piety, and the performing of miracles, even minor ones, is a power he comes into only in the fullness of time. I’m working on a hybrid plan where cleric “spells” are really abilities and, like thief abilities, they’re not always effective. That is to say, a first level cleric has about a 50% chance of healing anything on any given day. It was inspired at least partially by your bit on magic disciplines so, if you want it, you get partial credit. I’m still not a fan of the crusader aspect of clerics, though admittedly it makes them a more interesting class than the healdroids that my PCs lugged around as henchmen back in the day. I am not a fan of “no spells at first level” for clerics. I understand the arguments for, it is just that they do not hold much water with me [e.g. never had a problem with clerics being more than a healer]. Mark me down for No Spells At 1st. I like to look at it like the cleric is proving himself, his faith, courage, and convictions. The lack of a 1st level spell in the ACKS game worked fine for my group, and they’ve all survived into level 2. The clerics in the party have become adept at killing, and the human cleric is one of the main fighters of the group. I think the Mortal Wounds mechanic helps off-set the lack of magic healing, that and the use of herbs and the Healing prof.
One other thing to consider is that if first level clerics don’t get spells then all those evil acolytes you encounter in the older games are easier to run. You can populate evil temples with lots of first level clerics without worrying that spells will be flying everywhere. I think this is why you don’t see as many evil acolyte encounters in AD&D. It also means that the local village priest isn’t magically solving all the villages problems. Something else which came up on G+ that I didn’t mention here is that first level clerics still get the turn undead ability, which I consider more central to the class than spell casting. It’s true that this is situational, but then all class abilities are situational to various degrees. Clerics are one of those things that took forever to sit right with me. I entered the hobby with 2E, so to begin with it never quite made sense why the cleric was so fighty when there was already a paladin. Cranted there were some fighty clerics IRL of yore, but always struck me as not so much known for their overtly miraculous nature as the less-fighty holy folks. My thinking was that no one really wanted to play characters beholden to others for power, or play a healbot. So fighting ability, undead turning and other perks were tacked on as an enticement. And why undead? Why not demon turning instead? Casting out evil spirits is a pretty widely established trope it would seem. Where’s my noncombatant shaman or cloistered monk? It’s only years later I’m hearing the cleric was essentially a glorified vampire hunter to begin with. I also started with 2E, and learned about the history of the cleric within the past year. I have to say, I think the cleric as demon hunter is much more interesting than a generic priest class. The demon hunter cleric also seems much more appropriate as a dungeon adventurer. The cultural specificity is pretty important to its appeal though, and many people dislike that pseudo-Christian base. In any game I run now, turn undead works on demons as well as undead (using equivalent hit dice). I believe similar approaches have been formalized in a number of recent systems, such as Swords & Wizardry (though only for the most powerful clerics) and DCC (it calls the ability “turn unholy” which is awkward language but more inclusive). Likewise, I believe ACKS clerics can turn demons at high levels.